Sport-specific, 9-week program specifically designed to prepare athletes for the DEA FAST (Foreign-Deployed Advisory and Support Team) Selection Course. The plan includes a 1-week taper, and is designed to be completed the 9 weeks directly prior to your selection course start week. This is a very intense, 6-day a week, often 2x/day training program with high levels of volume and stress. 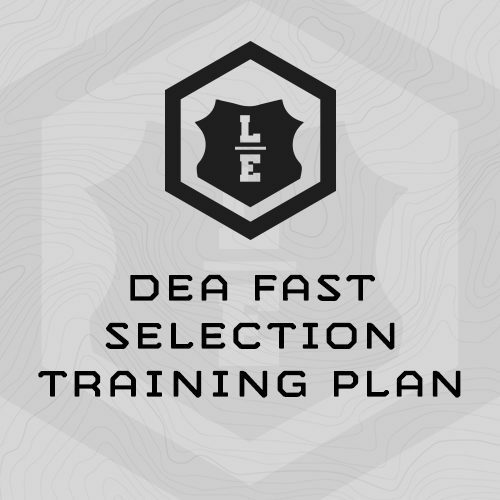 The intensity of this training plan reflects the volue and intensity of the DEA FAST selection course. To successfully complete this program you’ll need to make training for selection a priority during your work day. This plan is “sport specific” to the specific fitness demands you’ll face at DEA FAST selection – specifically work capacity “smoke sessions,” running, swimming and rucking. It aims to build your “combat chassis” – legs, core, lungs and heart, overall durability, and endurance/stamina for long days on your feet, in kit, during selection. • GPS-enabled Watch. A GPS enabled watch will make measuring run and ruck distances much easier, as well as maintaining required pacing. We like the Garmin Forerunner 10 or Foreunner 15. • 60# and 80# Sandbag. We sell sandbags here (http://gear.strongswiftdurable.com/collections/frontpage/products/sandbag) or you can use any old duffle bag. Wood Pellets or mulch made from ground up tires make great filler. • 10# Rubber Rifle, sledge hammer or dumbbell. You’ll carry this while rucking.